Here are ten things in the Affordable Care Act that will help end discrimination and improve women’s health. We bet you haven’t heard of most of them. 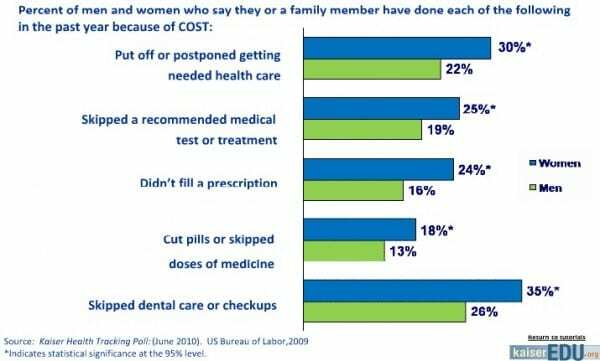 For women purchasing their own coverage on the individual market, their premiums were anywhere from 4% to 48% more than for men, a difference of up to hundreds of dollars a year. Starting in 2014, insurance companies will no longer be able to charge women more than men. Advocates for women’s health said one of the new law’s benefits would be to ban the denial of health coverage to women who have had a prior Caesarean section or been victims of domestic violence. Some companies providing individual policies have refused coverage in those circumstances, regarding Caesareans or beatings as pre-existing conditions that were likely to be predictors of higher expenses in the future. The Times article cites the example of one woman who was denied coverage because she had a medically mandated C-section. The insurance company explained in a letter that if she had been “sterilized” she would have been eligible for coverage. Starting in 2014, insurers can no longer deny coverage based on pre-existing conditions. birth control (for more on the controversy surrounding this provision, check out our last post here). Working mothers have had to carefully tailor their schedules so that they can pump milk in the middle of the day, and avoid stares when they put bottles in the communal refrigerators. Some have to use a bathroom stall to pump milk, as there is no other space available. Nursing mothers will now get additional support, thanks to page 1239 of the health care bill that President Obama recently signed into law. It requires employers to provide “a place, other than a bathroom, that is shielded from view and free from intrusion from co-workers and the public, which may be used by an employee to express breast milk.” Only companies with less than 50 employees can claim it’s an undue hardship. Besides requiring large employers to provide a place where nursing mothers can express breast milk, the new law also says that employers have to provide a reasonable break time to do so. The new law provides grants to local community organizations, hospitals and even state or local governments to provide education and services for the diagnosis and management of postpartum depression. Senator Robert Menendez (D-NJ), who sponsored the bill, which was added to the Affordable Care Act, has more information on his website. Medicaid covers more than 4o% of all births nationwide, but many women lose coverage after having the baby, because Medicaid’s post-pregnancy income guidelines are much more restrictive. 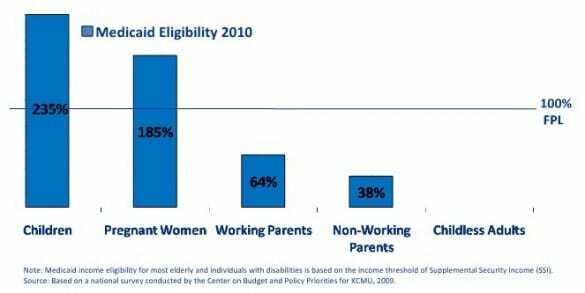 Currently, pregnant women are eligible if they make up to 185% of the federal poverty line (FPL), but most working parents have to make less than 64% of FPL to qualify. 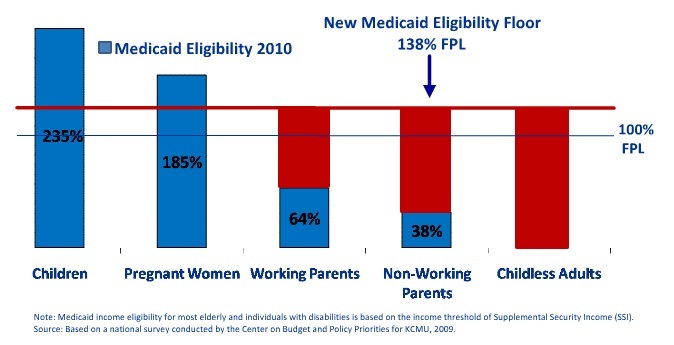 Under the new law anyone making less than 138% of FPL will be eligible for Medicaid, allowing many low income mothers to maintain their coverage after giving birth. Under the new law 100% of nurse midwife services will be covered under Medicare. It may not sound like a big deal since Medicare covers very few births, but the Medicare payment schedule is used by many insurers and state Medicaid programs to determine what services they’ll cover. The new law also guarantees that Medicaid will cover services provided by free-standing birth centers. The Maternal, Infant, and Early Childhood Home Visiting Program will provide $1.5 billion in grants to states to develop home-visitation programs for pregnant women and families with young children. Through these programs, nurses, social workers, or other professionals will meet with at-risk families in their homes and connect them to needed services like health care, developmental services for children, early education, parenting skills, child abuse prevention, and nutrition education or assistance. For way more information on the benefits of home-visitation programs, the Center for American Progress has a great (and thorough) brief on the issue. 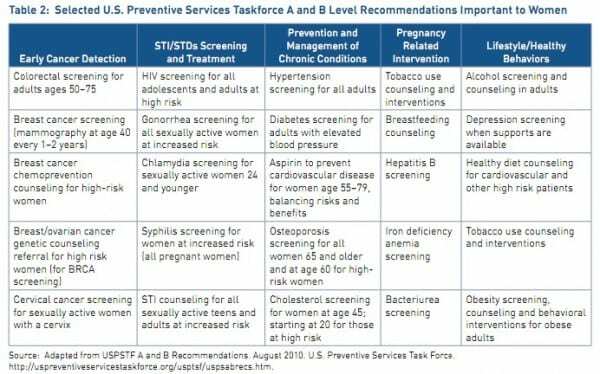 The new law formally establishes Offices on Women’s Health in major federal agencies, including Health and Human Services, the Centers for Disease Control, and the FDA among others. The law also creates a National Women’s Health Information Center to facilitate exchange of information regarding health promotion, prevention, major advances in research, and other relevant developments in women’s health. I really like this blog entry. Clear, well-written, and makes some great points. Thanks Rob! Take Our Quiz on Health Reform!